Well, my “little” brother turns 27 today. So, to commemorate, I thought I’d give him a lovely post on my little blog. 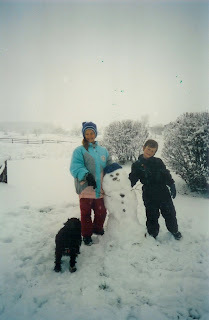 Brett and I spent six years of our childhood in Wisconsin where we explored acres of forest behind our house, built igloos in the six foot snow drifts outside our front door, built the most glorious snowmen you’ve ever seen and played Atari in the basement. As little brother’s go, Brett was a pretty good one. Sure, he was a pain in the rear end, but he was also very tolerant of me. 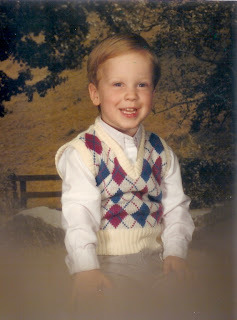 There is the distinct possibility that I may have tortured him when he was younger. Like the time we were staying home alone and I pretended to fall down the stairs and break my leg. Or the time I sent him into the basement and screamed at the top of the lungs because I knew he was scared of monsters. I also took sick pleasure in waking him up in the mornings by standing over his bed and letting out a blood curdling scream. Cruel, I know, but if you’ve never done that to someone, you should try because it. is. funny. 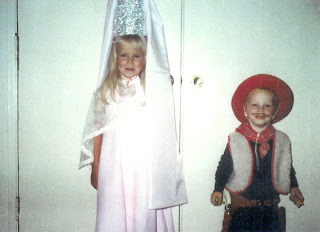 Another form of torture was to dress Brett up endlessly and make him enact all sorts of dramas and plays with me. Through all this, he never really complained – he just went along with whatever I said. In my defense, there were some sweet times that we shared as well. Every year growing up, we would make Brett a bed on my floor on Chritstmas Eve and he and I would wake up around 3:00 am and I would read to him, usually Garfield and Ziggy cartoons, until about 4:30 when we would tear down the stairs hopped up on excitement and little sleep. We still call one another at the crack of dawn on Christmas just because it’s tradition! One of my most distinct memories of our time in Wisconsin is the day that Brett and his friend Matt decided to go on a long walk through the woods. When they didn’t return after a couple of hours, my mom and I began traipsing through the fields, yelling their names. Finally, my mom sent me through the neighborhood and she decided to search the trees. I remember calling his name and fearing deep down that something terrible had happened. After another hour of searching, I headed home and found Brett and Matt sitting on the front step, covered in mud. In that moment, I was immensely relieved that they were okay and at the same time I wanted to strangle both of them for putting us through that. Instead I just told them that mom was looking and she was furious. They ran inside and went to Brett’s room to change clothes. Outside we could see my mom stomping back through the field, her face laced with fury and terror. I heard Brett say to Matt, “There’s my mom….she looks weally mad.” Come to find out they had walked a couple of miles through the woods to a friends farm! Crazy kids. Now, my brother is a man. He is a United States Navy veteran. He is a hard worker and still one of the kindest, most tender hearted people you will ever meet. Brett would give you the shirt off his back if you needed it. I’ve always said that if you become friends with Brett, you have a friend for life. He is a good man and I’m proud of him. Brett is also a phenomenal writer – much better than I am – and he is wildly creative and gifted in a lot of ways. I look forward to seeing how those talents and gifts play out. I love you, Brett. Happy Birthday. I hope you have an amazing day – wish I could be there with you. I have no excuse for the outfit I’m wearing in this picture. Wait – yes I do…it was the 80’s. We have been secretly stalking your blog now for several weeks waiting for the right time to pop up and comment. Ha-hah! Here we are! The hbowe part came from the silly words you have to type in to post your comment…sorry, the cursor was in the wrong box…. Ummmmmmm, not quite sure what to say about that last outfit. That is really something!! What a sweet relationship you and your brother had and still seem to have, growing up. That first pic of him, I can see a lot of Sloan! LOVE the crimped hair side pony tail glittery head band look. Very nice. It was fun hanging with ya today! Your babies are super cute! Hope ya’ll have a great weekend! That is great that you and your brother were so close growing up and still have that great bond to this day! I can see a lot of Sloan in that first picture of him, I always thought that Sloan favored Lee but maybe not quite as much now that I have see the picture of Brett. Hope you are having fun with the family! 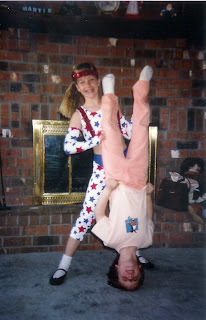 You were wearing that outfit because it was an 80’s gymnastics outfit! You thought you were really cool at the time. You know how for years you have had a great time laughing at my hair styles and clothes? It makes me laugh that now you laugh at your pictures. What a beautiful tribute to your brother. HOLY COW! That picture of your brother could be a picture of Sloan! WOW! That’s so cool! Thanks for sharing those pics babe…it takes a brave woman to boldly share 80’s memorabillia.